I decided to go see a podiatrist. Not because I didn't fully believe or trust my doctor, but I really wanted to get a full understanding from someone who only deals with feet and ankle injuries. I'm exactly 4 weeks out on this stress fracture and was (key word) in the boot for 3 weeks. The podiatrist said that a full break takes 8-12 weeks to heal and a stress fracture about half of that time. That means at 4 weeks, I'm totally on the mends. He gave me the OK to do non-impact workouts like cycling and even said to try the elliptical. I admitted I'd been doing the bike and he said that was perfectly fine as long as there had been no pain. Phew! Oh, and the biggest news was that I could ditch the boot! That in and of itself was like angels from heaven. I'm still not cleared to run, but at least there's an end in sight to the injury. He said to wait 2 more weeks then start going out for test runs. The biggest thing is that I have to realize that I can't just jump back in where my brain thinks I should be. I have to be very very cognizant of what my body tells me. My first run may only even be a quarter of a mile he said. But honestly, I'll take even that. My plan is to follow a walk/run schedule to get back into it. Slow and easy. It's absolutely something I would give a new running client, so I'll just have to follow my own advice here. Things I Missed While Wearing "The Boot"
Since I'm not bound to the boot now, I thought I'd share what I have missed the most since wearing that hideous contraption. Driving. Now, I've driven, but I have to take the boot off, put on a normal shoe to drive then put the boot back on when I get to my destination. This means I have not looked forward to leaving for lunch breaks because of the whole boot on/off ordeal. Walking Normally. The boot is a good 2.5-3 inches high. This means it completely throws off my gait when walking unless I have the exact right heel height for the other foot. Let's just say the left side of my low back is all kinds of messed up now. Normal Shoes. I'm a shoe girl. I love shoes: heels, wedges, flats, boots, peep toes ... shoes. Apparently I only have a select few pair of shoes that match (or sort of match) the height of the boot. I've worn the same outfits over and over so that I could wear those specific shoes. Being Undetected. I never realized how nosy people can be. Wearing the boot made me very obvious to others apparently. 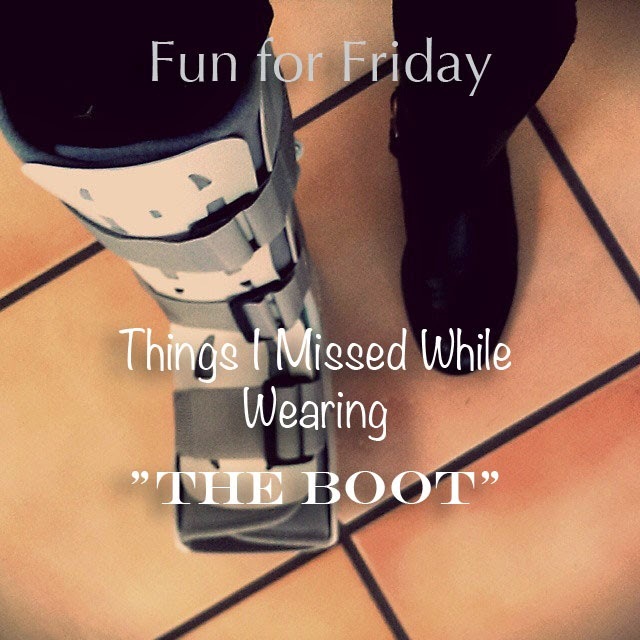 People stared down, the went out of their way to step around me or hold doors or let me pass first, even better, complete strangers wanted to strike up conversations asking me what I had done to earn the boot. Oh, not to mention the boot was squeaky. Taking the Stairs. I live in a 2-story home. I work in a building that often requires heading up one flight of stairs for a conference. I'm one who readily takes up to 5 or 6 flights of stairs rather than use an elevator. So, to have to use the elevator for a single flight or to have to really calculate the true need of having to go upstairs in my own home? Very frustrating.